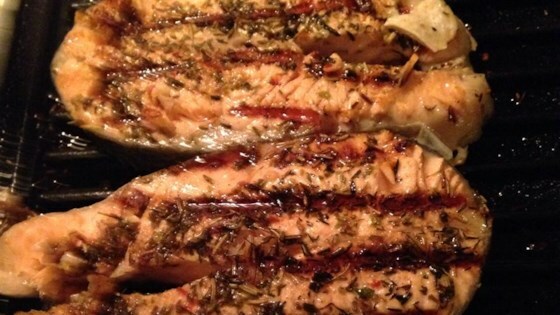 "I wanted to get more fish in our diet, so I experimented with different flavorings for salmon steaks. This combination seemed to always be especially delicious with a risotto and vegetable side." Season one side of each steak with the Italian seasoning, thyme, rosemary, salt, and pepper. Lay the steaks with the seasoned-side down on the prepared grill. Cook on grill until the flesh flakes, turning once, 7 to 8 minutes. Sprinkle each steak with lime juice to serve. I cant believe. It was so so easy to cook. I adapted recipe a little by grill the salmon on the skillet instead of broiling. No vegetable oil added when cooking on skillet. It was awesome menu. I really enoyed this easy flavorful recipe. I topped it with some bruschetta and fresh grated romano cheese for a real Italian treat. Delicious! I used a thick fillet and broiled it, but used these Italian seasonings - nice change from our usual dijon/dill/lemon combinations. I will definitely make this one again! This recipe yielded salmon that was tasty, but not really special. I think the addition of lime juice was necessary. This recipe has room for experimentation and seems to be easily adaptable. This was so easy and delicious! We couldn't believe how simple it was but a great combination of flavors. The lime was the final great touch. Wouldn't change a thing.